All credit goes to my dad for these. He made these for us at his house and they were amazing. 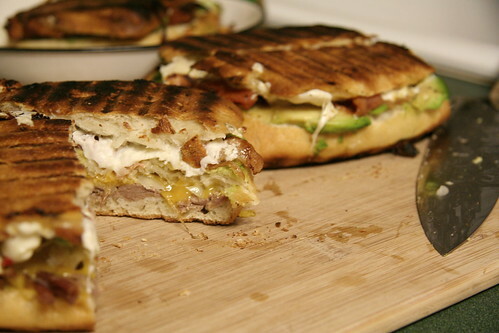 He takes ciabatta bread and cuts it into thirds and makes a club sandwich out of it and then panini grills it on his Hasty-Bake. We had left over roast from a pot roast so Eric wanted to try out a roast beef version. 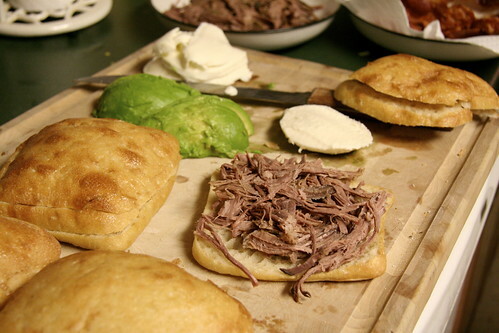 Sliced ciabatta bread and avocados. Bottom layer topped with roast beef. Then onions and cheddar cheese. 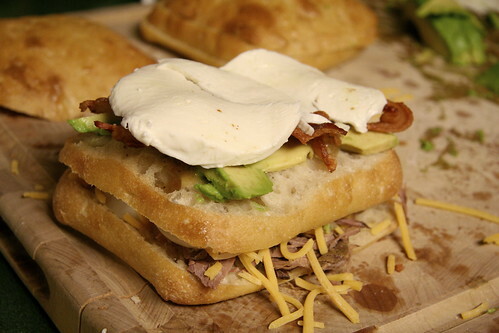 Then another layer of bread and then topped with avocado. Followed by bacon, mozzarella and dressing. Then you smoosh it and grill it. Then you slice it and eat it. MMM. My. Oh. My. This will solve the "what on earth do I serve for lunch" conundrum on a regular basis now.